This case study examines the effects of an EFL teacher’s autobiographical story on 26 Spanish primary students in terms of comprehension, raising interest, engagement, motivation and willingness to communicate in L2, by comparing it to a story in the ELEANITZ multilingualism project. A questionnaire, a behavioural observation instrument and a post-test survey were used to collect data. The data was analysed using descriptive statistics, t-test, effect size (Hedge’s g) and content analysis. The results reveal that the students understood the autobiographical story better, found it more interesting, it triggered their personal stories and increased their willingness to communicate in English. Stories are the stuff life is made of, it could be argued paraphrasing Shakespeare. Narrative is basically the way in which humans think, and construct meaning and identity; we experience, organise, understand, explain and project life as a series of narrative episodes or stories (Howe & Johnson, 1992; Rossiter, 2002; M. Turner, 1996). Coupled with this, storytelling is the means by which narrative is communicated (Daniel, 2012). The cognitive power of stories makes them a widely used resource in teaching and learning processes and an important research topic in education. In particular, this study focuses on the use of the autobiographical story in the context of teaching and learning English as a Foreign Language (EFL). More specifically, it aims to explore the effects of the teacher’s personal stories on the comprehension, interest, engagement and motivation of primary students learning EFL. This case study tackled those objectives by telling a group of fourth grade primary students an autobiographical story and a story contained in their regular ELEANITZ course book on different lessons, each followed by a questionnaire to assess comprehension and motivational aspects. Additionally, both lessons were recorded on video and the students’ engagement was assessed with a behavioural observation instrument. Thus, the ELEANITZ story served as a benchmark against which the results of the autobiographical story could be compared and discussed. The following sections of the introduction provide essential information on the context for the study, and state the research questions that have guided it. The second chapter consists of a brief literature review closely related to the research questions. The methodology applied in this case study is presented in the third chapter, including information on the participants, the procedure, the materials used and the instruments for data collection. The fourth chapter presents the data analysis and results obtained in the study. Finally, the fifth chapter discusses the results, and the sixth chapter summarises the conclusions of the study. The closing sections of the document contain the references and six appendices. This case study was conducted during my school placement, which lasted 12 weeks and was held at Astigarragako Herri Eskola, a state-funded school located in Astigarraga (Gipuzkoa, Spain). It has 537 students, 236 of them in pre-primary or the Early Years Foundation Stage (EYFS) and 301 in primary. There are two or three classes per grade with up to 25 students per class in primary. This school follows the ELEANITZ multilingualism project, which comprises story-based learning materials for EFL created in the Basque Country. As part of the school policy, EFL teachers pretend to be native English speakers. Along the school placement, some teachers claimed that in general students lacked motivation to learn EFL, regardless who their EFL teacher was. On the other hand, I observed that the EFL teachers preferred to keep the same rhythm for all the classes in the same grade, that is, to cover the same part of a particular unit on the same week with all classes. That caused the need to make occasional adjustments on the lesson planning, for instance, when a public holiday led to one class missing a lesson in a particular week. 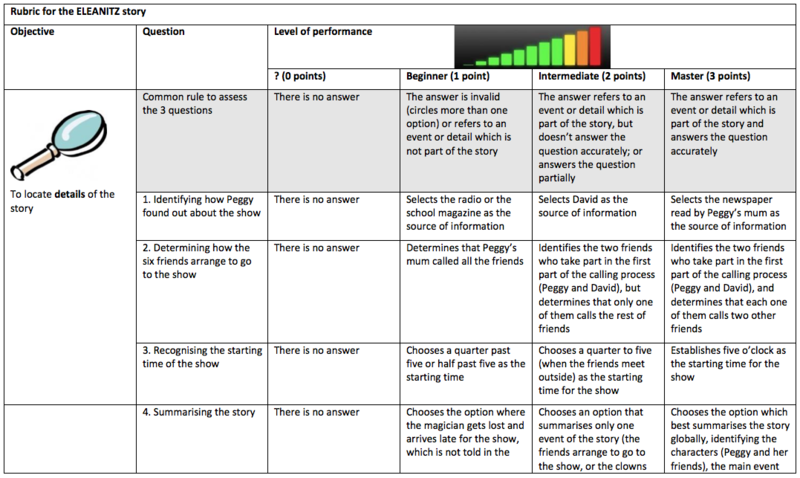 Often, the adjustments introduced in the lesson planning consisted on a storytelling activity using materials other than ELEANITZ. Previous studies suggest that the autobiographical story may have some features that could complement the ELEANITZ stories used at the school. Hence, the autobiographical story might be a suitable candidate for the extra storytelling activities that the EFL teachers occasionally introduced in their lesson planning at school. There are numerous studies on the use of autobiographical storytelling to reflect on teacher practice and as a means to improve university-led teacher training, as well as on the use of autobiographical storytelling produced by students to promote the development of identity and for language learning. Yet, less attention has been paid to the use of the teacher’s autobiographical story in the context of EFL learning. A previous study conducted on university students of EFL (Kazuyoshi, 2002) reports that personal stories told by the teacher in the context of EFL teaching and learning can influence the interaction between teacher and students, as well as among students; enhance willingness to communicate using the second language (L2) in class; change students’ attitude towards mistakes in L2; raise engagement and motivation, and serve as a catalyst to create a collaborative learning environment. All those are key factors for success in the process of learning a foreign language. However, little is known on the effect of the teacher’s personal stories on children learning EFL, and this study aims to explore this issue. The ELEANITZ story offered an excellent benchmark against which the autobiographical story could be compared, since the ELEANITZ material had been designed by experts and had undergone extensive testing and research for several years. However, I had concerns about how well the students would understand an autobiographical story created by me, as it would affect competence and, thus, motivation. On the other hand, I wanted to cause minimal disturbance in the original lesson planning of the EFL teacher. For that reason, introducing one lesson around an autobiographical story close to another lesson where the story of a new ELEANITZ unit was going to be introduced for the first time seemed like a good idea. What are the differences between an autobiographical story and a story in the ELEANITZ course book in terms of comprehension by the students? What are the differences between an autobiographical story and a story in the ELEANITZ course book in terms of raising interest and motivation among the students? This chapter outlines briefly topics that are closely related to the research questions that guided the study. In particular, it reviews the roles of stories in education and language teaching and learning, the use of autobiographical stories in education, and some specific aspects of storytelling that can have an influence on comprehension. The opening section presents the different views on how stories can be used in educational contexts. 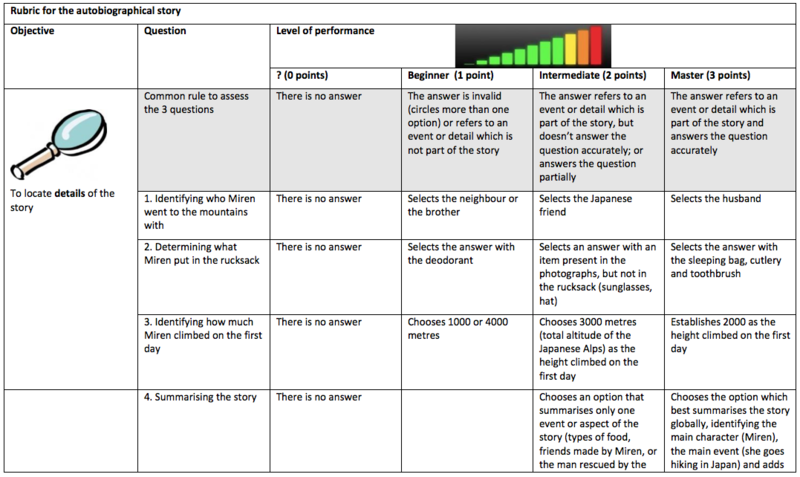 The second section narrows the focus to summarise how stories are often used in language teaching and learning. The third section gives an overview on the role of stories in the multilingualism ELEANITZ project created in the Basque Country. The fourth section deals with ways to use autobiographical stories in education, particularly in language teaching and learning. The fifth section explains briefly how the views on the way to use stories relate to points of view on wider issues regarding the communicative approach in language teaching. Finally, the last section outlines the main variables of storytelling with an effect on comprehension that are relevant to this case study. 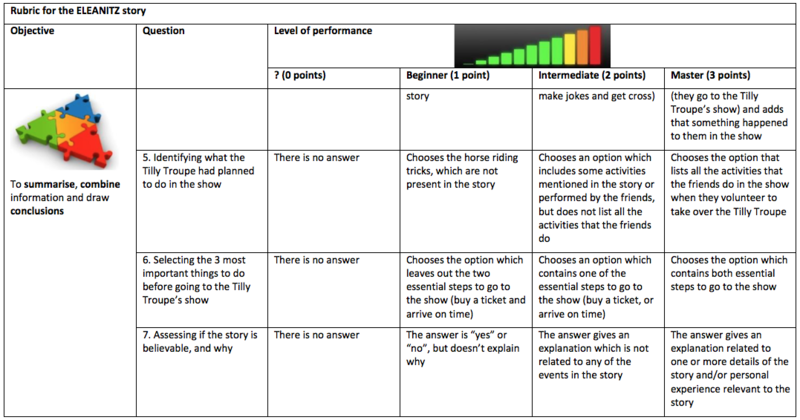 It could be argued that regarding their main purpose when used in education, narrative and stories form a continuum, where storytelling just for the sake of it would be on one end, and using stories as a hook to engage students in learning a given topic (Freadman, 2014) would be on the other end. Therefore, on the one hand, some authors claim that a story is a work of art, whose primary purpose, even when used in education, is to give joy, not to instruct “using” it as a text (Bryant, 2008; Fox, 2013). Hence, stories should be given to children as a gift, and not a prize that needs to be gained (Pennac, 2008). On the other hand, it is believed that since from a very early age children are familiar with narrative structure and conventions, stories can act as a valuable vehicle for learning, for they can convey new learning content wrapped in a recognisable and memorable context (Ellis & Brewster, 2002; Garvie, 1990). Thus, stories are seen by others as powerful tools to develop a wide variety of competences, skills, knowledge, attitudes and subjects in the curriculum (Ellis & Brewster, 2002; Howe & Johnson, 1992; Zaro & Salaberri, 1995), in addition to the most obvious communication competences, which the next section will deal with. Introduce new vocabulary and structures, which will be easily acquired thanks to the fact that children enjoy listening to stories over and over again (Ellis & Brewster, 2002). Enhance fluency in the four skills (Paran & Watts, 2003; Wright, 1995). Improve pronunciation, including stress, rhythm and intonation. Above all, stories provide vital scaffolding to children in the challenging process of language acquisition, due to the familiar structure of narrative. That encourages the development of the seven core strategies for the construction of meaning, namely, predicting, making inferences, self-questioning, comprehension monitoring, summarising, determining importance and focusing on text structure (Dewitz, Leahy, Jones, & Sullivan, 2010). As a result, there are numerous guidelines for choosing, adapting and telling stories with language learning in mind (e.g. Bryant, 2008; Ellis & Brewster, 1991, 2002; Fox, 2008; Garvie, 1990; Howe & Johnson, 1992; J. Morgan, 1983; Paran & Watts, 2003; Read, 2007; Wright, 1995), suggestions for activities to apply before, during and after any story (e.g. Ellis & Brewster, 1991; Fox, 2008; Howe & Johnson, 1992; Wright, 1995), as well as proposals of activities and lesson plans on specific stories (e.g. Ellis & Brewster, 1991, 2002; Howe & Johnson, 1992; J. Morgan, 1983; Paran & Watts, 2003; Read, 2007; Wright, 1995). However, even those who write about the application of stories to language teaching warn against their use merely to introduce and practise language features, as they can lose their magic (Wright, 1995). The power of stories to convey meaning, even in situations where many words are new for the listener, has made them a tool extensively used in foreign language teaching and learning. As a result, not only is there a wide range of teaching proposals built around stories (see section 2.2), but entire teaching methods have evolved around stories. The Teaching Proficiency Through Reading and Storytelling Method (Alley & Overfield, 2008) or the Narrative Format Model developed by Taeschner, Di Pietro and Artigal over the last decades (Artigal, 1990; Taeschner, Gheorghiu, & Colibaba, 2013) are two examples. The latter was adopted in the early 90’s by the “ikastolak” (fee-paying private schools) of the Basque Country to teach EFL within the multilingualism project called ELEANITZ (Euskal Herriko Ikastola EKE (EHI EKE), 2013). The primary school where this study was conducted is part of the ELEANITZ project. The ELEANITZ project has been developed by experts in multilingualism and EFL teaching and learning. It has also been tested and its results researched over the last decades (e.g. Arzamendi et al., 2003; Azpillaga et al., 2001; Cenoz, 2011; Cenoz & Etxague, 2011; Elorza, 2005; Elorza & Muñoa, 2008; Garagorri, Elorza, & Lindsay, 1997; González Somocurcio, 2014; Ikastolen Elkarteko Eleanitz-Ingelesa Taldea, 2003; Lasagabaster Herrarte, 2011). ELEANITZ comprises story-based EFL learning materials for children aged 4 to 12, based on the narrative format, which consists in the collective and repeated dramatisation of stories. Typically, the materials in ELEANITZ cover five or six stories along the academic year. The material includes copies of each storybook for the students to read in the classroom, and CD recordings of the stories, among others. Typically, each story is first dramatised by the teacher and students together. Visuals and recorded audio input are added in subsequent retellings of the story later on, and each story leads to further activities to work on the language and the topics introduced by the story (Gipuzkoako Ikastolen Elkartea, 2009). Autobiographical storytelling, that is, the telling of stories about oneself (Rossiter & Clark, 2007), is a particular type of use of narrative that has received wide attention in narrative inquiry applied to the construction of identity among teachers, in educational research, and in language teaching and learning over the last years. In the first place, autobiographical storytelling is often used as a tool in the process called action research, as defined by Reason and Bradbury-Huang (2001), in order to reflect on practice and develop practical knowledge among teachers (e.g. Davis, Beyer, Forbes, & Stevens, 2011; Msila, 2011; Petit, Mougenot, & Fleury, 2011; Quackenbush, 2010; Savvidou, 2010; Schmidt & Knowles, 1994; Walters, Green, Wang, & Walters, 2011). It is also used as a means to improve university-led teacher training, particularly during school placements (e.g. Kugelmass, 2000; Le Fevre, 2011; Rivera Maulucci, 2011; Wilson, 1993). Secondly, autobiographical storytelling produced by students has been used in education, especially as a tool to promote the development of identity; in the development of literacy; and for language teaching and learning, mostly concerning writing skills (e.g. Ajayi, 2011; Bromer, 1995; Desjardins, 2011; Keane, 2010; G. Park, 2011; Pilon, 1993; White, 1995; Wu, 1994). Equally important, the last years have seen a decisive shift from paper to the digital format in storytelling in general, and autobiographical storytelling has not been an exception. Therefore, an increasing number of researches in digital storytelling related to the topics outlined above have emerged over the last years (e.g. Keane, 2010; Kobayashi, 2012; Liu, Wu, Chen, Tsai, & Lin, 2014; Menezes, 2012; Savvidou, 2010; Walters et al., 2011). A less explored use of autobiographical storytelling focuses on personal stories mainly as a motivational resource in the language classroom. A study conducted on university students of EFL (Kazuyoshi, 2002) reports that the teacher’s personal stories provoked students to share personal stories with each other, use more English among themselves in the classroom, and look for opportunities to practise English outside the classroom. Kazuyoshi used four personal stories in his university course on Australian English and Culture, which were not planned originally and emerged as he responded to his observations and the reflections of the students in their action logs (diaries meant to activate metacognition on language learning). For instance, when he observed that several students used their first language (L1) in the group activities in class, he introduced a story on his own mistakes as an EFL learner, which relaxed the class atmosphere and encouraged students to use more English. After Kazuyoshi told his story as an EFL learner in Australia, his students started to share their own stories about their visits to Australia. Similarly, his story about teaching Japanese to an Australian student, and how this one student had made an effort to use Japanese outside class, led to several EFL students seeking opportunities to practise English outside class. In their self-evaluation, students reported having felt highly motivated, curious to know what the next personal story would bring, and happy because the course had given them the opportunity to get to know their classmates better, and make new friends. Thus, the results of this study suggest that the opportunities for belongingness (the establishment of close relationships with others), competence (success in meeting goals and interacting), and autonomy (to follow one’s interests and values) were improved among students. All those are known to be basic principles leading to student engagement (behaviour involving participation and effort to learn), which can be encouraged by several strategies led by teachers (J. C. Turner, Christensen, Kackar-Cam, Trucano, & Fulmer, 2014). Developing learners’ cross-cultural awareness, with his stories on Australia. Promoting the students’ self-efficacy with regard to achieving learning goals, by sharing with them his difficulties in EFL learning. Promoting favourable self-perceptions of competence in L2, by reflecting in his stories on the view that mistakes are a part of learning. Decreasing student anxiety, by sharing his mistakes in EFL. Increasing the attractiveness of the course content, by using authentic materials in the form of his personal stories. Arousing and sustaining curiosity and attention, with the unexpected contents of his autobiographical stories. Increasing students’ interest and involvement in the tasks, by encouraging students to share meaningful personal stories with their classmates. Trying to be empathic, congruent and accepting, by being real and authentic through his personal stories and by sharing his own shortcomings in EFL. Modelling student interest in L2 learning, by sharing his personal interest in EFL and EFL learning with the students. Introducing the tasks in such a way as to stimulate intrinsic motivation and help internalise extrinsic motivation, by using the interest that students showed in his personal stories to introduce new challenges. Promoting the development of group cohesion and enhancing intermember relations, by creating situations in which students could share genuine personal information through their own autobiographical stories. Finally, Kazuyoshi reports that his personal stories had a contagious effect on the students and, as a result, it motivated him to tell more stories, which caused his engagement to improve. Hence, the autobiographical storytelling activities increased his motivation as a teacher, and there is increasing evidence that teacher motivation reflects on students’ achievement, learning behaviour and motivational state (Dörnyei, 2001; M. J. Guilloteaux & Dörnyei, 2008). The different views and uses of storytelling that have been summarised in the previous sections transcend the topic of storytelling, and have links with different views within the communicative approach in language teaching and learning. Actually, the use of autobiographical stories proposed by Kazuyoshi (2002) agrees with the dialogic model proposed by Thornbury (2001) and several principles of the Dogme ELT movement (Meddings & Thornbury, 2009), whose three core concepts are conversation-driven, materials-light and emergent language-focused teaching. In fact, Kazuyoshi’s personal stories could be labelled as Dogme “moments,” due to their resemblance to some of the activities proposed by Meddings and Thornbury for teaching “unplugged” (2009). In summary, the type of use of stories is related to wider issues regarding methodologies and approaches to language teaching and learning. 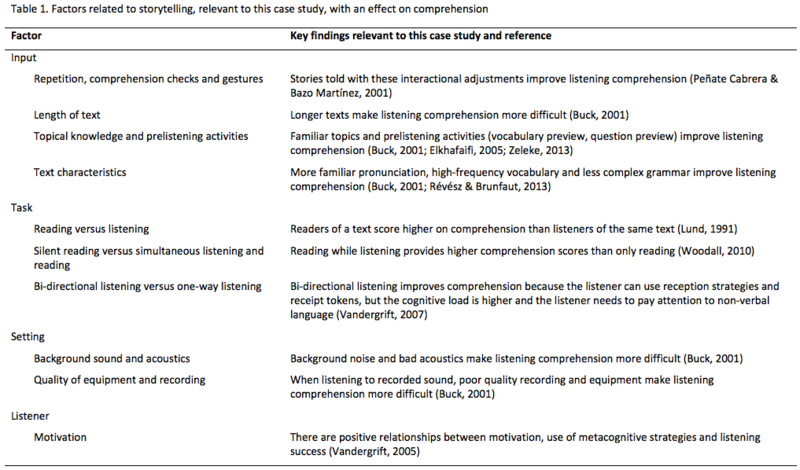 There are comprehensive sources of information on the nature of listening comprehension, its assessment and the current lines of research on the topic, such as the works by Buck (2001) and Vandergrift (2007). Rather than trying to summarise the main concepts of this vast research topic, Table 1 focuses on the most relevant aspects in the context of the present case study, that is, the variables that, at the time of telling a story, are known to have an effect on comprehension.